Not to be confused with 89th Sustainment Brigade. The 89th Infantry Division, originally known as the "89th Division," was an infantry formation of division-size of the United States Army that was active during World War I, World War II, and the Cold War. The 89th Division was officially activated in August 1917 under the command of Major General Leonard Wood. The division was inactivated in May 1919. The division was reconstituted in the Organized Reserve (present-day United States Army Reserve) on 24 June 1921 and assigned to the states of Nebraska, Kansas, and South Dakota. The headquarters was organized on 2 September 1921. 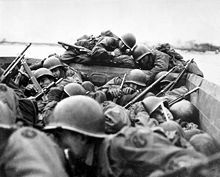 Soldiers from the Division cross the Rhine River in assault boats, 1945. The 89th Infantry Division landed in France at Le Havre, 21 January 1945, and engaged in several weeks of precombat training before moving up to the Sauer River into jump-off positions east of Echternach, 11 March 1945. The next day, the offensive began, and the 89th plunged across the Sauer in a rapid advance to and across the Moselle, 17 March. The offensive rolled on, and the division assaulted across the Rhine River on 26 March 1945 under intense fire in the Wellmich-Oberwesel region. A pontoon bridge was built across the Rhine from St. Goar to St. Goarshausen. In April, the 89th attacked toward Eisenach, taking that town on 6 April. The next objective, Friedrichroda, was secured by 8 April. On 4 April 1945, the 89th overran Ohrdruf, a subcamp of the Buchenwald concentration camp. The division continued to move eastward toward the Mulde River, capturing Zwickau by 17 April. The advance was halted, 23 April, and from then until VE-day, the division saw only limited action, engaging in patrolling and general security. Three towns, Lößnitz, Aue, and Stollberg, were kept under constant pressure, but no attacks were launched. The 89th was reactivated as a Reserve unit in 1947 with headquarters in Wichita, Kansas and redesignated as the 89th Division (Training) in 1959. In 1973 the division colors were cased and the shoulder patch (but not the lineage and honors) was continued in use as the 89th Army Reserve Command (ARCOM). (ARCOMs were not tactical commands, but were instead regional conglomerations of unrelated units. Upon mobilization, units within the ARCOMs would be assigned to active duty units with which they were aligned.) The 89th ARCOM was later redesignated as the 89th Regional Support Command, and in 2003 it became the 89th Regional Readiness Command. In its 2005 BRAC recommendations, United States Department of Defense recommended realigning the Wichita US Army Reserve Center by disestablishing the 89th Regional Readiness Command. This recommendation was part of a larger recommendation to re-engineer and streamline the command and control structure of the Army Reserves that would create the Northwest Regional Readiness Command at Fort McCoy, Wisconsin. The 89th currently exists as the 89th Sustainment Brigade in the Reserve. Marcelino Serna - the most decorated soldier from Texas in World War I.
Ferdinand Louis Schlemmer – Division camouflage officer in World War I and noted artist in civilian life. ^ Pike, John. "89th Regional Readiness Command". 89th Infantry Division website: http://www.89infdivww2.org/index.htm. Price, Craig (December 2018). "Meuse-Argonne: The Final Push to Victory". VFW Magazine. Vol. 106 no. 3. Kansas City, Mo. : Veterans of Foreign Wars of the United States. pp. 16–18. ISSN 0161-8598. For Doughboys of the 89th Infantry Division, a desperate fight in a French forest illustrated the brutality of World War I's final months. The Meuse-Argonne Offensive was the war's largest and bloodiest campaign for U.S. troops, but it marked the beginning of the end of the war. This page was last edited on 23 January 2019, at 10:03 (UTC).